Our high altitude grown grass hay is a high-quality mix of premium Horizon variety Timothy hay with some Meadow Foxtail hay and native meadow, high altitude grasses and clovers, which is an excellent blend for pleasure, ranch and rodeo horses and especially for prize race horses. All our hay is produced by natural rainfall and extensive flood irrigation from pure Gunnison River water, which significantly improves the consistency and quality of each annual hay crop. The hay is harvested early to maximize tenderness and nutritional value. 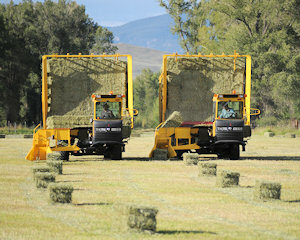 The high altitude summer climate of the Gunnison Valley, with cool nights and warm days, produces Timothy hay with superior nutritional value. The annual weed eradication and control techniques we employ produces hay that is very low in noxious weeds. We hand-sort all bales when loading and eliminate bales that do not meet our quality standards. This further assures that you will receive only the greenest, highest-quality hay. We sell both smaller 16″ x 18″ bales and 3′ x 4′ larger bales to accommodate our growing customers’ needs. Our hay is stored in covered sheds to prevent weather damage and mold. When shipping hay long distances, we cover the load with tarps to prevent damage while in transit. The history of Timothy grass hay in America goes back to the colonial late 1600’s, when the native Scandinavian seed was first brought into the country for growing nutritious horse and cattle fodder. For more information about its origins, please read our article entitled The History of Timothy Grass Hay. Esty Ranch began an extensive interseeding of all three of our ranches in 2003 with a new variety of Timothy grass hay named Colt. Colt has significant improvements over the Climax variety. Colt has an earlier maturity than Climax, which is a significant benefit in the Rocky Mountain, high altitude Gunnision, Colorado environment because of the short growing season. Colt seed heads are longer than those of Climax and Colt stems are significantly leafier than those of Climax. When you compare a bale of Colt vs. Climax Timothy grass hay, you can clearly see the improvements. The specialists at the University of Manitoba, School of Agriculture, Department of Plant Science, felt strongly that Colt would provide a greater nutritional value vs. 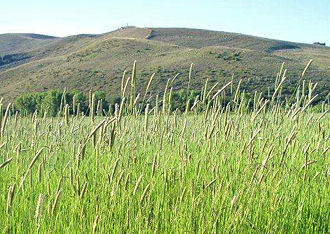 Climax for Timothy grass hay produced in the Gunnison, Colorado area, and their opinion has been proven correct. In 2009 we began interseeding with another new and further improved variety of Timothy named Horizon. It has all of the benefits of Colt plus many significant nutritional improvements. Horizon is a relatively new Timothy variety developed in the northern island of Hokkaido, Japan. It is currently considered to be the best variety of Timothy grass hay because of its excellent nutritional value. Esty Ranch takes pride in the quality of our sales support and the personalized delivery services we provide. We have our own class 8 tractor trucks and special 57 and 53-foot flatbed trailers (one with a walking deck). We offer flexible delivery dates and times. Esty Ranch will deliver Timothy grass hay to you when you want it and need it, and not a day or a week late, which frequently occurs when hay is delivered by independent truckers. Contact us to see what we can do for your delivery of our high quality Timothy grass hay. Note: We will arrange to truck freight our hay to East, Gulf and West Coast ports for containerization and international shipments.